By cupcakeSerenity on September 4th, 2012 . Filed under: Cupcake Ideas . If you knew me a little better, you’d know why I’m quite so excited about this. You see, I have a small obsession with John Deere. Not that I would know what to do with a tractor in any practical sense, I just think the colors and logo look really cool–like t-shirt, knick-knack and pot holder cool. So, I’m very excited to find these John Deere baking wrappers and cupcake picks on Amazon for only $1.79. 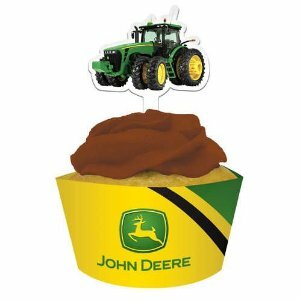 And when I make my John Deere cupcakes, I will be sure to use green food coloring and bright yellow frosting!